Agent Mike Ciani reports Hall of Fame jockey and three-time Kentucky Derby winner Kent Desormeaux will begin riding full time at Santa Anita next Saturday, May 10. Agent Danny Thomas reports that Kent Desormeaux will return from the East Coast to ride at Santa Anita on Santa Anita Derby Day. Agent Danny Thomas, who represents Hall of Fame jockey Kent Desormeaux at Santa Anita, has added veteran Joe Steiner, effective immediately. Desormeaux will make Keeneland his base of operations when that meet starts on April 4. Agent Danny Thomas reports Kent Desormeaux will ride regularly at Keeneland when the Kentucky track opens April 4. Desormeaux, with seven wins from just 27 rides at Santa Anita, a 26 percent average, is at Oaklawn Park tomorrow to pilot Ride On Curlin in the Grade II Rebel Stakes for trainer William Gowan. 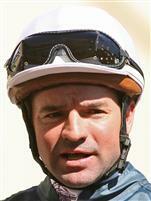 Congratulations to Kent Desormeaux, who celebrates birthday No. 44 today but is riding like he’s 20 years younger. The Hall of Fame jockey has six wins from just 20 mounts this meet, a 30 percent average. 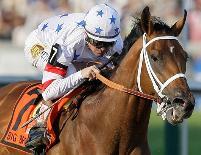 Desormeaux will be at Aqueduct Saturday to ride Noble Cornerstone for Wesley Ward in the Gotham Stakes. With a fourth Kentucky Derby win his major objective, Kent Desormeaux will ride Noble Cornerstone for trainer Wesley Ward in Saturday’s Grade III Sam F. Davis Stakes for 3-year-olds at Tampa Bay Downs. The Hall of Fame rider also was named to ride Unbridled’s Note for Steve Asmussen in Saturday’s Grade II Arcadia Stakes at Santa Anita. “Barring any last-minute changes, Kent will not ride at Santa Anita tomorrow,” said his agent, Danny Thomas. “We really appreciate the opportunity given to us by Steve Asmussen, but Kent’s main focus is on winning the Derby and that’s the priority right now.” Desormeaux returned to Santa Anita last Saturday and won two races on the Sunshine Millions California Cup card, including $132.40 longshot Susans Express in the Oaks. If only the stars would align so as he would get the ride on Union Rags. What's going on with his this meet at Gulfstream? A lot of shorter prices are falling.... perhaps he's just on some cold horses. Can My Boy Jack duplicate his Southwest win on fast dirt?